This month, the CSC started a new project that focuses on our keiki age birth to five. We hosted two Ohana Time events. The purpose of these events is for our young keiki and their families to learn through play. Play is essential, vital, critical, and fundamental to a keiki’s social, emotional, physical, and intellectual development (Butler, “Learning Through Play”). For more information about the importance of learning through play, read this article at Early Childhood News. Members of the CSC Ohana Time group interact with Stuffee at Hawaii Children’s Discovery Center. Our first event took place at Hawai’i Children’s Discovery Center in Honolulu. 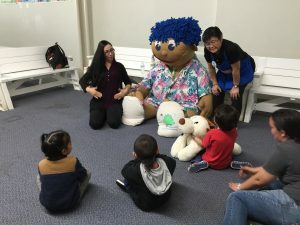 Our keiki participated in an interactive lesson with Stuffee, a seven-foot, blue-haired friend, and discovered the wonders of the human body from the inside-out. After exploring the digestive system, circulatory system, and respiratory system, they learned more about the amazing human machine with a visit to the Fantastic You! gallery. They continued to learn through play by exploring all the Discovery Center had to offer: a bank, doctor’s office, post office, grocery store, fire station, theater, the rain forest room and even enjoyed some outdoor adventures. To learn more about the human body and to practice at home with your keiki, check this this web page at Living Life and Learning. This website offers free printable, videos and options to buy life-like body kits to continue learning and exploring the human body. 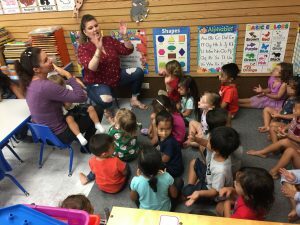 CSC’s Kim Duncan (pictured, left) leads the second Ohana Time group in active play, social play, manipulative play, creative play, and more, at Got Funn in Kaneohe, Hawaii. For more resources and videos, come check out the lending library at the CSC. We hope more families join us for future events. Please feel free to contact Kim Duncan at kimduncan.csc@gmail.com for more information.